This is my 37th installment of Babywearing Stories 365. Each installment features a babywearer in 1 photograph and their answers to 5 questions. My goal is to normalize, promote and celebrate daily Babywearing, moving beyond *what* we use to carry our babies and shifting focus back on *why* and *where* we carry. I hope to share the stories of moms, dads, and babywearing caregivers all over the world. Enjoy! My name is TaiLeah. I have 3 kids, a son and 2 daughters – Miles (5), Quinn (2.5), and Maeve (11 weeks). I am tandem wearing my son, Miles, who is about 3.5 yrs old and my daughter, Quinn, who is about 15 months. We are at a local grocery store doing our weekly shopping. I am using a Wrapsody Breeze (Gauze) Wrap for my daughter and an Ergo for my son. I frequently tandem wore my older two from the beginning, especially when we had things that we needed to do, like grocery shopping. It really helped my son adjust to no longer being the only child. And it helped me get stuff done. It was definitely a workout, no need for a gym when you are wearing an extra 50 lbs of kid. I haven’t had to tandem wear as often this time around with my daughters but Quinn still asks to go in the carrier when we are out and about. January 2012 around 5 pm. It was late and we needed stuff for dinner. I was alone with both kids and they needed me. Wearing them was my only option to accomplish all I had to do in a timely manner. 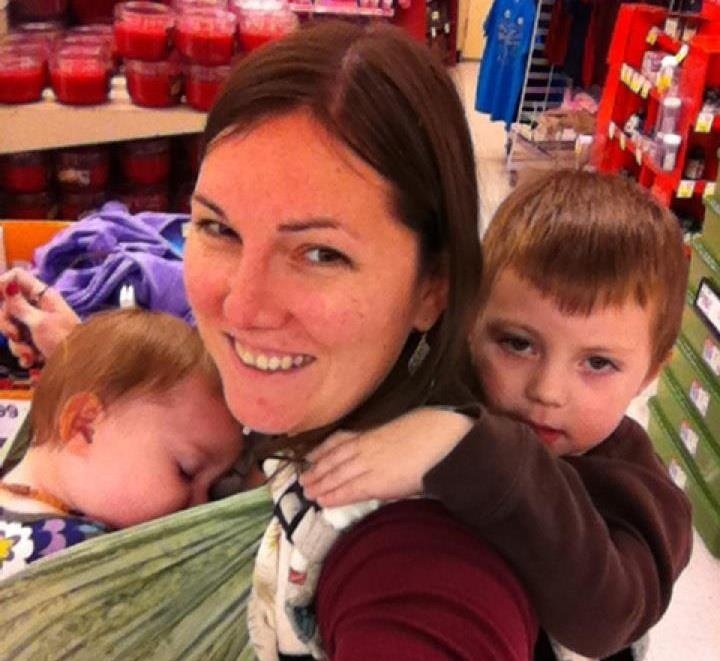 With more than one child, I don’t see how you can get things done without babywearing. It is an essential part of my parenting. It has become even more important with my third baby. She all but asks to be worn. At night, she prefers to be in the wrap to fall asleep over any other place. I know this time is short so it is even more precious to me and I cherish holding her close.